Manual therapy is a general term for a set of methods and techniques (performed hands of the therapist) involved in the diagnosis and treatment of reversible functional disorders of the musculoskeletal system (arthritis – peripheral joints and spine, muscles, fascia, ligaments). To the field of physiotherapy and is supported by scientific research. In Poland, training in manual therapy, are held as postgraduate training for physiotherapists and doctors. During therapy with special techniques mobilization or handling and working on soft tissue restores the biomechanics of joints impaired (unlocking the joints) and the relaxation of mobility and soft tissues, leading to pain relief, increase range of motion, resolution of inflammation. This therapy may be used alone or as a complement to other forms of therapy. 6. The joint mobilization based on muscle energy therapy. Deep tissue massage is to skillfully use a variety of techniques to remove tension and dysfunction myofascial in a very gentle and safe for the patient who undergoes surgery deep tissue massage is not just a passive recipient, but is actively involved in therapy by performing the movements and thereby increasing the activity of tissue relaxation. Structural bodywork on the basis of the chains anatomical (“Structural work with the body”, structural integration). Method physiotherapy uses: muscle chains concept by Tom Myers, concepts feature tonic Hubert Godard, neuromobilization, and the concept of “fascial fitness” – fascial efficiency Schleip Robert and Tom Myers. This is a form relaxation of myofascial based on the most effective techniques of direct impact to the main intermuscular septum and interosseous membrane and the muscle energy in terms of techniques and body posture and mobilization especially the joints of the foot. It is perfect for working with disturbances within the muscle and fascia as well as the therapy of postural analysis myofascial chains – analysis of muscle imbalances. Fig.1, Fig.2. 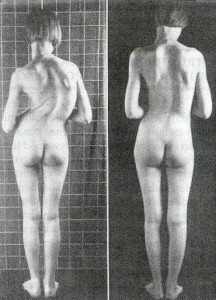 Silhouette before and after Structural Work with the Body. Tapes myofascial front and back are responsible for dysfunctions bending forward and extension. Side web dysfunctions responsible for bending in the side. The tape spiral is responsible for the dysfunction spiral rotating in the body and the nature of postural functional mainly in the transverse plane. Relaxation of myofascial a specialized therapeutic approach used in the treatment of many disorders of the musculo-fascial. Therapy is aimed at soft tissues, in particular the fascia covering the muscles, organs and the whole body of man. This is the precise stretching and relaxing the tissues examining the problems of the patient as a whole. Disturbances in the fascial system on today most patients manifested by shortening tissues and their excessive tension can cause pain and a number of different symptoms in different areas. This way of working with the body to be effective in treating ailments such as back pain, frozen shoulder syndrome, tennis elbow or golfer, osteoarthritis, tension headaches, and many others. This therapy by eliminating adhesions and gluing and removal of restrictions and limitations tissue in a myofascial, visibly reduces pain and improves the posture of the patient. One of the elements relaxation of myofascial trigger point therapy is, which is an integral part of the treatment. Trigger point therapy is a method of physiotherapy, which consists in making use of the most effective techniques painful points in the human body are in the course of excessively tight muscle fibers. These points, when they are irritated, causing pain radiating specific, accompanied by myofascial pain and disrupt the work of the muscles. The therapy is based on the study, use of appropriate therapeutic techniques and prevention (learning autotherapy). • removal of pain and feelings of stiffness. 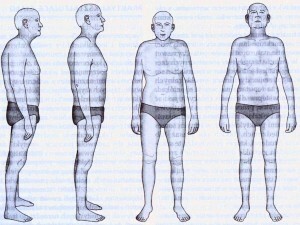 Many functional dysfunction in the body, caused by a malfunction of bone connections – joints (articular disrupted the game). These restrictions, or lack of mobility and / or pain, prevent the execution of a movement (eg. Extension and flexion in the right side of the lumbar spine, the lack of dorsiflexion of the ankle joint, etc.). Mobilization of joints based muscle energy consists in restoring joint mobility using postisometric muscle relaxation exercised in a precise position of the patient. Other techniques work on the joints, use eg. Joint mobilizations carried out eg. With the help of traction (remoteness of the articular surfaces). Restoration of normal articular game, eliminates pain and restores mobility of joints, giving the patient the possibility of normal operation. 6. John Smith, “Structural work with the body”, ed. WSEiT, Poznan, 2014., P. 27 + Fig.1. p. 11, ryc.2.str. 35.